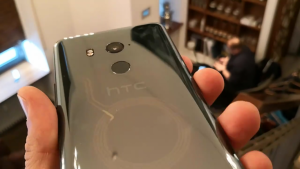 It’s now 2 days until HTC officially announces their final 2017 devices, the flagship HTC U11+ (with a larger 6″ 18:9 LCD display and key improvements over the regular U11) and the mid-range HTC U11 Life (an Android One device with a Snapdragon 630 SoC many U11 features at a cheaper price point). As we approach launch day, the rumor mill starts turning faster and faster. Both the HTC U11+ and the U11 Life have been leaked in full during the past few days, so we already know what to expect from HTC’s launch event. 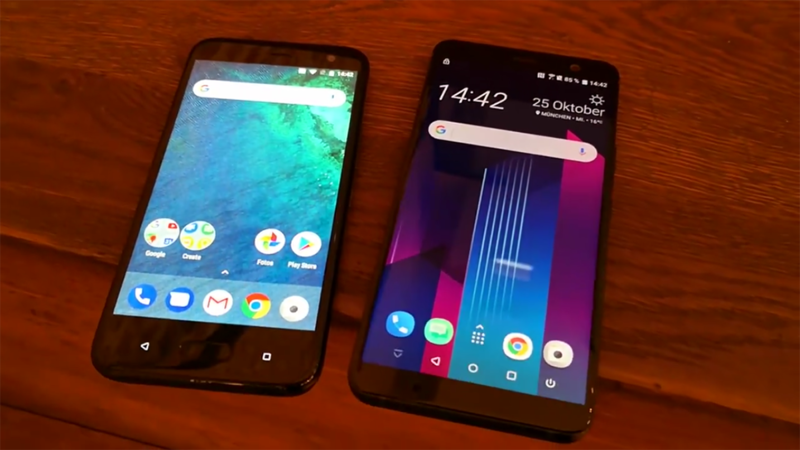 This time around, though, both devices have appeared in a full hands-on video before their release. A German-language news outlet called Blick has managed to get a hold of the HTC U11+ and HTC U11 Life, giving us a close look at what is going to be announced on Thursday. The star of the show will, obviously, be the HTC U11+, HTC’s latest flagship refresh which will be marketed as the superior alternative to the U11. The video confirms that the device will feature a 6″ QHD+ display with considerably reduced screen bezels as well as wireless charging capabilities, contextually aware Edge Sense, and a mammoth ~4000 mAh battery while keeping the water resistance rating. The phone also adds some extra software features like a rotary-dial like app shortcut reachability feature which can be accessed by long-pressing the frame. The device will also come in a translucent version together with the regular color options. This translucent version, while it’s not completely transparent like JerryRigEverything’s clear back mods, does leave the wireless charging coil and other internal components visible from the back of the phone. The phone will be available in a 128 GB storage configuration, but it’s not clear yet whether we’ll find other storage configurations like on the U11. There are also some visible improvements that are not directly referenced in the video, however. 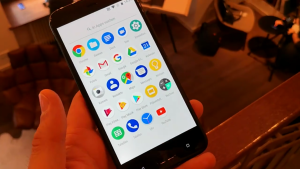 For example, the phone in the video sports the stock white Android Oreo notification shade with Sense UI icons and the Sense Home launcher features what looks like adaptive icons for Dialer, Messages, Camera, and Google Chrome. While the Android version is never directly shown during the video, these two things, together with the previous rumors that the device was launching with the newest version of Android, give us some fair confidence that the U11+ will indeed launch with Android 8.0 out of the box. And this would mean that users will be able to take advantage of other added benefits, like Project Treble for better update support. The black edition of the HTC U11 Life, the HTC U11’s upcoming mid-range little brother, is also depicted in the video. The first thing we notice is that the phone swaps the glass back found in the U11 and U11+ for a much more modest polycarbonate back, likely to keep costs low, and downsizes the U11’s 5.5-inch display for a 5.2″ panel. It does feature Edge Sense and other features found in the U11 and U11+, though. However, the similarities end there. The main seen difference between both devices, aside from the external looks, is the radically different software. That’s because the U11 Life is a part of the Android One program, and as such, the phone runs stock Android (with some HTC additions like the camera app) instead of HTC’s own Sense UI skin. Previous rumors said that the phone would come in both Android One and retail editions, featuring stock Android 8.0 and Sense Android 7.1 respectively, so there’s no surprises here. Finally, the video also covers the pricing aspect for both devices. The HTC U11+ will retail in Switzerland at a hefty 849 Swiss Francs, which equals 851 dollars, while the HTC U11 Life will retail for a much more modest 349 Swiss Francs ($350). We can expect the HTC U11+ to retail for something like $699 or $749 in the United States given the typical pricing disparity. The U11 Life’s $350 price tag, however, is something we can expect for the US as well, given that its direct competitor, the Moto X4, is available for $399. It is not clear yet whether this was an intentional leak or the site accidentally broke embargo on the pre-recorded video, since the video was taken down shortly after being published on Blick‘s official Facebook page and there’s currently nothing regarding both devices on their website. But if you would like to have a look at the video yourself, you can have a look at a video mirror here. Both of these phones will be officially announced this Thursday, so be sure to stay tuned to XDA to know more about the U11+ and the U11 Life as soon as they are announced.